Rich Shih’s assortment of kojis and misos. A few years ago, Rich Shih received a request from a local chef familiar with Shih’s kitchen experimentations: make koji for a fermented foods dinner. The mechanical engineer knew nothing about koji, the mold used to transform soybeans into the rich umami paste known as miso, but Shih immediately accepted the challenge. And, as the consummate food tinkerer is wont to do, he took the task much further. Shih cultivated that koji for the dinner, but then, he says, he became interested in using it to make miso: “I just started playing around, adding different flavors out of curiosity.” He’s since cured varieties of miso not seen in any store: peanut butter miso, ricotta miso, bacon miso, even cookie dough miso. Koji, a white mold that forms an airy layer atop partially cooked rice and other grains, releases a floral, grapefruit, yet funky scent. This intoxicating smell, which Shih called “addictive” — more akin to that of a citrusy IPA than to putrid rot — might be why koji is among the oldest domesticated molds, perhaps as old as ones used for making cheese. People in China have been cultivating koji for at least 2,000 years, though John Gibbons, a biologist at Clark University who studies koji and its domestication for human use, says there’s evidence of what might be koji from 9,000 years ago in China. Koji is somewhat finicky, demanding plenty of surface area on the wet grain, along with a warm, humid climate, similar to that of its home region. Gibbons says we don’t know exactly when or how this discovery was made, but at some point in food history, people realized koji could be employed to make tasty new products. As the mold grows, it produces a cocktail of enzymes. When a rice- or barley-koji starter is mixed into a second food source, such as soybeans, those enzymes break down the legume’s starches, sugars, and proteins, making them available as a food source for an entirely different community of microbes. The new microbes ferment and transform the beans in the process. Koji provides the base to produce soy sauce, miso, and sake (koji-fermented rice instead of beans). While koji can be purchased dry from stores, Shih wanted it fresh, which he says tastes better, and in massive amounts. To grow the mold at home, Shih followed a template provided online, using only an insulated cooler, an aquarium bubbler, an aquarium thermometer, and a rack on which to spread a thin layer of partially cooked rice. A new batch can grow in about two days. The contraption sits in the middle of his kitchen in his home in Lawrence, which he shares with his wife, his 9-year-old daughter, and countless jars, tubs, and racks throughout the small building that hold examples of his various cooking experiments. 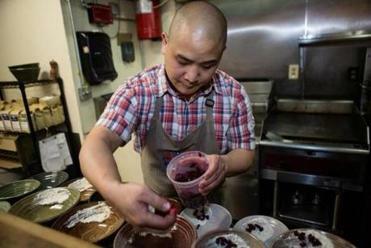 Rich Shih prepared the Borscht Beet Kvass. Once he understood how koji and miso work, Shih considered what he could invent. Soybeans, traditionally fermented in Japan into miso, have a particular ratio of proteins, fats, and sugars, so he searched his house for other sources of those same building blocks. He began inoculating mashes of just about anything he could with the koji-infused rice. Plantain miso was boring and too sweet, he said, because plantains don’t have enough protein, which provides the basis for miso’s characteristic umami flavor. Raw eggs, he said, tasted putrid. But successes outnumbered failures. I tasted some of his more recent (and more delicious) miso variations: miso peanut butter had aged to a deep, almost wine-brown tone, and tasted like the perfect base for an Asian-inspired peanut dish. For miso hot sauce, Shih mixed in yogurt: The koji fed on and fermented the yogurt, and resulted in an extremely spicy, almost cheesy sauce. Cookie dough miso (yes, aged and fermented raw cookie dough) felt incongruous on my tongue, as my brain struggled to integrate the clash between the familiar sweet cookie dough hidden under the overpowering salty notes. Shih said he’s added it to traditional dough before baking, in order to impart depth and savory notes. While knowledge of koji and miso remains limited in the US, some, like Shih, have been experimenting. New York’s David Chang, famous for his restaurant Momofuku, among others, makes sunflower and chickpea miso pastes, which he calls hoson. And Shih is not the first Massachusetts-based miso renegade. When South River Miso, made traditionally in Conway, first started producing miso in 1981, owner Christian Elwell says they broke with tradition by fermenting chickpea miso, made from a Mediterranean as opposed to an Asian legume. 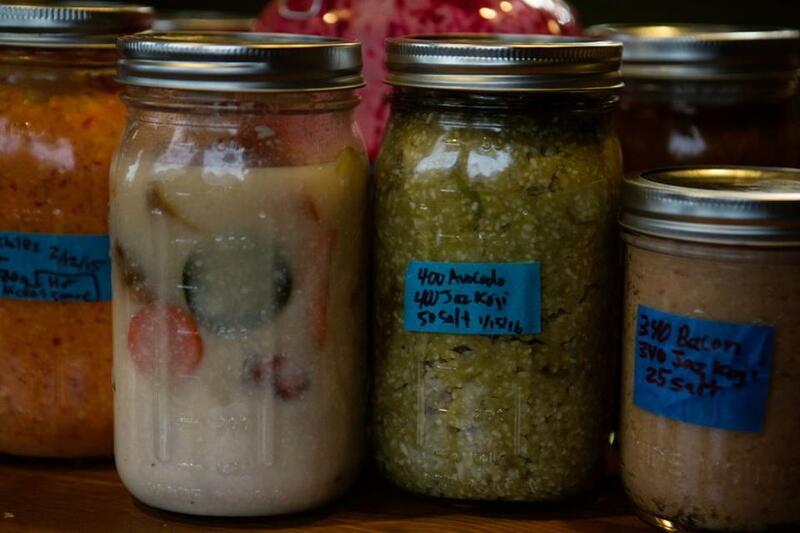 Kean has since gone on to make pistachio miso, coconut miso, and others. When Shih mentioned he wanted to host a pop-up, Kean offered his own restaurant. At the pop-up in March, attended by dozens of curious eaters, Shih and co-chef Nicco Muratore eschewed the miso vocabulary of Asian cuisine and instead employed his koji creations in dishes such as croquettes with pimento miso aioli and sunchoke agnolotti with ricotta miso. “I loved the menu,” said Kean. “I also picked up some tricks for my own repertoire.” For instance, copying Shih, he now makes ricotta miso; he can take homemade ricotta and, three koji-infused months later, cook with a deep, rich, umami-filled, Parmesan-like cheese. Shih’s koji-cured fish, one of the dishes at the pop-up, caught his attention, and Kean plans to use that technique as well. 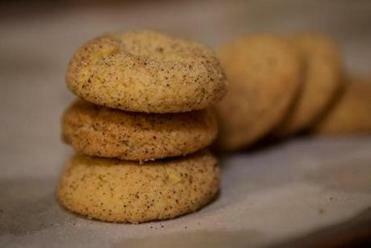 Sumac Sichuan Pepper Sugared Miso Snickerdoodle cookies. He taught me the trick to the fish he served at the pop-up, the one that inspired Kean. When we first met, he’d handed me a small jar of shio koji, a milky, grainy solution of koji rice in salt water. I bought a couple of thin fillets of ocean perch at the farmers’ market and, per his instructions, brushed them with shio koji and left them to soak during the day (instead of overnight, as he might suggest for a meatier fish such as halibut or hake). Then I was to rinse them off, pat them dry, sear one side of the fish in a hot skillet, then slide the fillets into the oven for only about five minutes. Though Shih recommended I dress the finished fish with vinaigrette and fresh herbs, my dinner companion and I were so blown away by the taste and texture that we left it plain. The koji had imparted a delicious savory flavor, and the slightly cured, firm flesh resembled that of one of my favorite Japanese dishes, miso black cod. We couldn’t stop exclaiming about the way koji had transformed the fish. Just as it transforms soybeans into miso. Just as Shih believes learning about foods such as koji and miso might transform our cooking in the future. Rich Shih hosts a brunch workshop on June 5 with chef Nicco Muratore, incorporating vinegar and teaching how to cook with it. The event takes place at 11 a.m. at Commonwealth, 11 Broad Canal Way, Cambridge, 617-945-7030, www.commonwealthcambridge.com. For more information and tickets, go to www.ourcookquest.com. Cynthia Graber is cohost of the podcast Gastropod. She can be reached at cynthiagraber@me.com. Follow her on Twitter @cagraber.